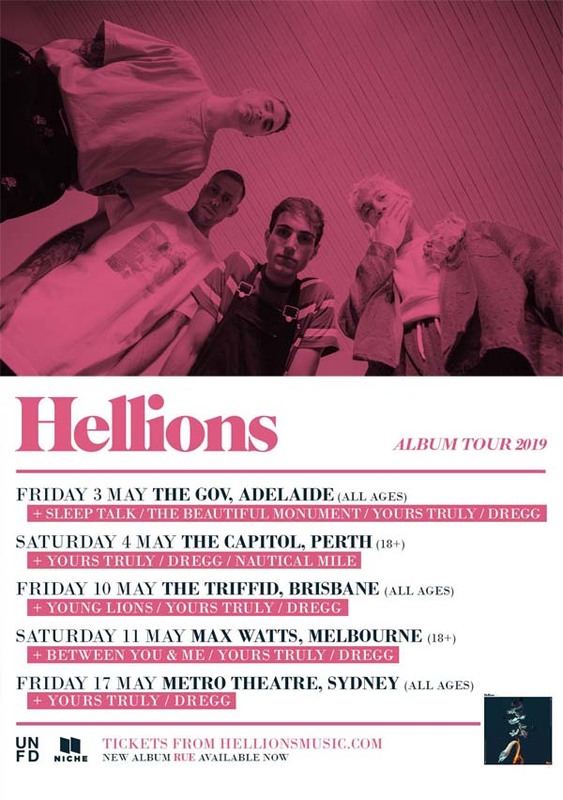 ​Genre-melding rock outfit Hellions are gearing up for their biggest run of Australian headline shows to date this May, stopping off in Adelaide, Perth, Brisbane, Sydney and Melbourne, with special guests Yours Truly and Dregg lending their support nationally. The band have handpicked some of their favourite Aussie bands to join them along the way including Sleep Talk, The Beautiful Monument, Nautical Mile, Young Lions and Between You & Me. With four studio albums and an ARIA nomination in their stride, Hellions have gathered millions of streams, winning over fans near and far with their theatrical sound and thoughtful lyricism. Praised for their creative madness and endless ambition, Hellions have rocked global Spotify and Apple Music playlists and earnt themselves regular spins on triple j with colossal tracks like X (Mwah), Smile and Harsh Light.